What's in my Junk Drawer Vlog! I am running a day late getting this up but I thought it was a fun vlog to take part in! So here is my video of my messy junk drawer! 2 comments on "What's in my Junk Drawer Vlog! " 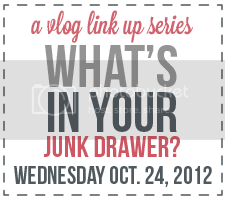 Soooo... you didn't record a vlog about your junk drawer? I'm confused.